Happy friday everyone! Here’s a bit about what’s in progress here at WM. I’m going to talk first about some updates to Alpine Lakes that are coming down the pipe. Thank you for everyone who wrote in with any issues they ran into with build 3025! I think most of the license-related hiccups are out of the way now, and build 3026 is intended to both fix some issues discovered in 3025 and also bring some improvements along for the ride. We’ve also continued to slowly flesh out the documentation on the new devices; we still need to write an overall “guide to water” however. If you ever run into issues with tiny pocket lakes appearing when you create water, 99.9% of the time the problem is you haven’t restructured the terrain for flow. Flow Restructure is useful in many different situations which is why it is a separate device, but you will almost always want to use a Flow Restructure device directly before Create Water! Modifying your terrain after a flow restructure device will, with few exceptions, break up the carefully created height differences that allow the terrain to drain properly. Next let’s talk about some of the upcoming improvements. Build 3026 isn’t available yet, but hopefully in the next few weeks. It contains a number of bugfixes, but also some larger new features. You can now simply wire the water datatype into the mesh output to export your geometry. Easy peasy. The Water Output macro is still useful when you want the flowmaps as well. River networks have a unique property in real life. Rivers are prescribed by terrain, but also profoundly shape it. This kind of emergent, positive-feedback effect can be tricky to control. And there’s no single solution – sometimes we want to guide things exactly, and other times to let nature take its course. So given that, we definitely want to support erosion post-water. However, in 3025 that doesn’t always work. First of all, it’s a bit annoying to setup the network needed – you have to extract the river mask, invert it, feed it into the erosion device. Then even when masking, if you really crank up the erosion you run into major problems where the terrain is eroded right out from beneath your rivers and streams. Witness this sequence. Dangling cliff-side stream: Where did my terrain go? guys?? Even with quite extreme erosion we now can be confident that the terrain won’t be ripped out from underneath/around the river network. Create Water has been carefully constructed to be scale-invariant; all other things being equal, the river networks should appear in stable locations no matter what resolution you build at. Sometimes the underlying terrain itself is changing! This happens when other devices are not scale invariant. This is often the case with erosion, etc, where the result when building at higher res can be quite different. 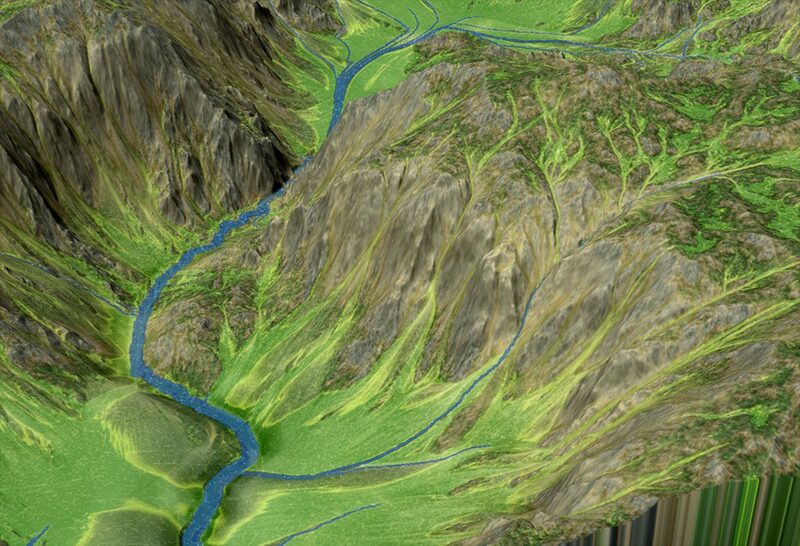 The scale-invariance only holds for convergent terrain. Convergent terrain simply means that water tends to combine rather than thin out as it runs downhill. This is usually true; but when water spreads out running down a cone-like surface, for example, it is not. What’s the solution? 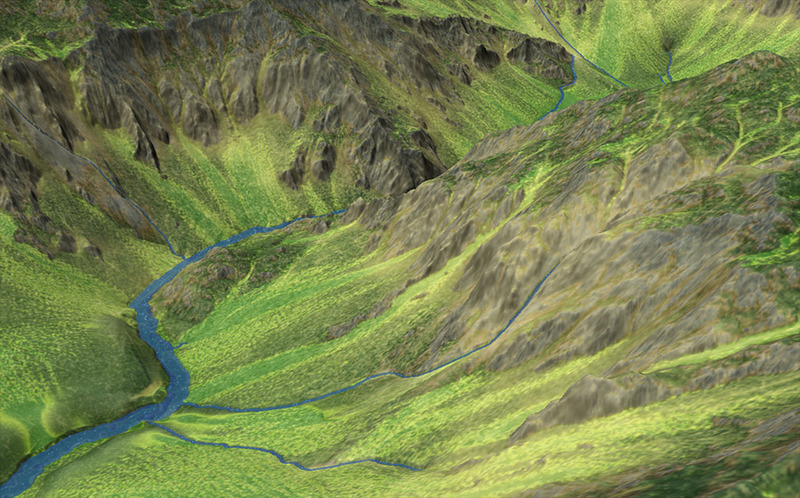 3026 will let you pin the headwaters of the rivers in place according to the current terrain. The rivers will still flow naturally when built, but they will only spawn where indicated. … and that’s all for now. Until next friday! Hey folks! 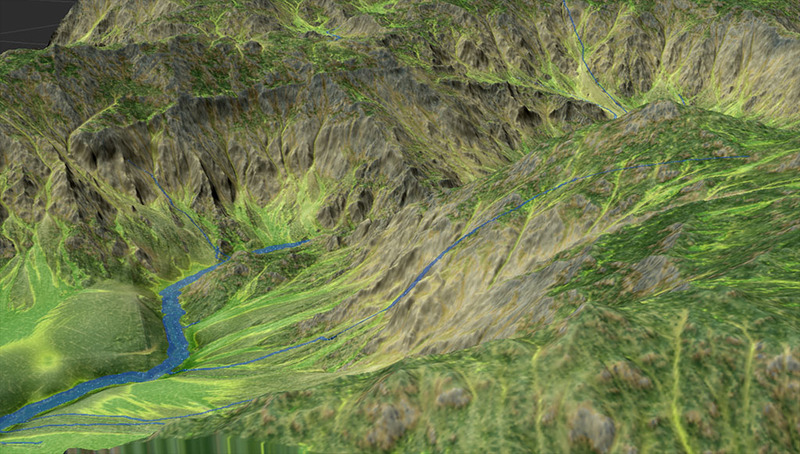 Just this morning, the first development build of the ‘Alpine Lakes’ branch of World Machine is now up! ‘Alpine Lakes’ is all about water and the effect it has on your terrain. new texturing based on soil wetness, and even have World Machine recraft your terrain by breaking through ridges and creating new drainage basins according to hydrodynamic principles. Which is also live. 🙂 The Help Center is pretty sparse as all of the device docs are still being written, but it will be the new home of all WM documentation and release notes in the future. Go check it out above. We’re literally loading up the truck right now and road-tripping down to San Francisco for GDC 2019! We’ll be demoing the new Alpine Lakes features there, so if you’re coming to GDC stop by our booth and say hello. Naturally since 3025 is a dev build, there’s sure to be some issues remaining. We’ll try to get to anything showstopping, but the next big focus is GDC. This is the first time we’ve had a booth there, and I’m very excited to talk to everyone. See you there!